With a stay at M PLACE in Pattaya (Central Pattaya), you'll be a 3-minute drive from Big C Extra and 12 minutes from Pattaya Pier. This hotel is 2.9 mi (4.7 km) from Phrabat Mountain and 5.3 mi (8.5 km) from Pattaya Elephant Village. Make yourself comfortable in your air-conditioned apartment, featuring a refrigerator and a flat-screen TV. Complimentary wireless Internet access keeps you connected, and cable programming is available for your entertainment. The bathroom has a shower and complimentary toiletries. Conveniences include a desk and complimentary bottled water, and housekeeping is provided daily. 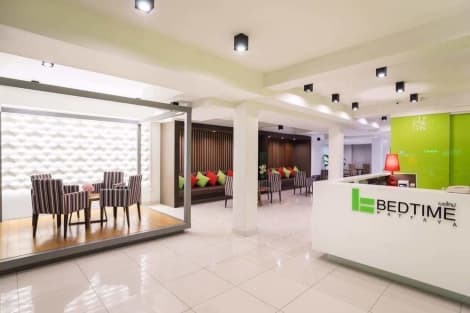 The hotel is located in the convenient location of Pattaya next to central festival shopping centre royal garden city centre and Pattaya avenue. Situated on the sea front of Pattaya beach road we are only 5 minutes walk to Walking Street.